One potential contributor to cancer is oxidative damage due to free radicals, but extra virgin olive oil is high in antioxidants that reduce oxidative damage . The oleic acid in olive oil is also highly resistant to oxidation and has been shown to have beneficial effects on genes linked to cancer . Many studies in test tubes have shown that compounds in olive oil can help fight cancer at the molecular level . A study in mice showed that a substance in olive oil can help to clear these plaques from the brain . A human controlled trial showed that a mediterranean diet enriched with olive oil had favorable effects on brain function and reduced the risk of cognitive impairment . 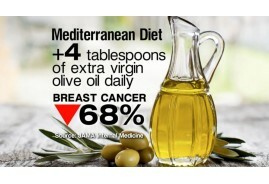 There is preliminary evidence that olive oil can help fight cancer and Alzheimer's disease, although this needs to be confirmed in human controlled trials. In one study, researchers heated extra virgin olive oil to 180 degrees Celsius (356 degrees Fahrenheit) for 36 hours. The oil was highly resistant to damage . Another study used olive oil for deep frying, and it took 24-27 hours for it to reach damage levels that were deemed harmful .